Want an early preview of what OnePlus 5 photos look like? Company executive Pete Lau shared a bunch of sample shots on his Weibo account. Although they don't have metadata to certainly identify them as untouched and original, they do boast a typical 4,608 x 3,456 size, indicating a 16MP resolution. So at least one of the OnePlus 5's dual cameras is going to be a 16MP unit. As for image quality, we'd say what we're seeing is on par with the best in current mobile photography. Of note is the high dynamic range, which enables the camera to depict the sunset scene in a rather striking way. Note the separation in color and detail, making for a beautiful and authentic photo. Color balance isn't precisely natural, but that's not necessarily a bad thing. Sometimes having the mathematically correct color balance leads to a less satisfying, not as lively photograph as it would have been with a little touch-up. While the exact dual camera setup formula used by OnePlus isn't clear as of now, the imaging software has been developed in cooperation with DxO Labs, an authority in digital photography. No matter if the dual camera is of the color + monochrome sensor variety, a normal + wide angle lens, a normal + telephoto lens (as on the iPhone 7 Plus and Xiaomi Mi 6), or something altogether different, things look promising for the OnePlus 5. The handset will be officially announced this coming Tuesday, June 20. Below, you can have a look at the samples (beware, the files are big) and read more of what we know about it so far. Jun 14, 2017, 3:56 PM, by Luis D.
That's quite an improvement over the OnePlus 3... 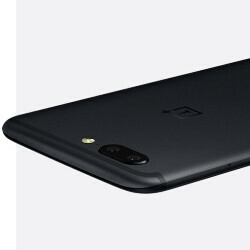 Seems like OnePlus is stepping up their game big time this year. better shot compared to a photo from CEO of "camera company"
If it's this good, I may consider it alongside the Moto X4 despite the difference of opinion we $100. I'll wait until reviews and GSMArena's battery test comes out to decide. I hope it's a normal + wide angle lens or normal + telephoto lens camera !! Amazing.. Though I can't rule out the possibility that they may have been doctored. Looks impressive let's hope the price is not to high & this will replace my Samsung S6 which is starting to stutter with only 3gb ram & only 4gb storage free. What model is yours? I'm on Nougat it's running buthering smooth plus it was bought over 2 years ago. Dude please. I'm tired of people saying their S6, S7 or S8 is smooth. They are simply not. They have microstutters everywhere. You're just too blind to see them. Any unbiased reviewer (notebook check, Erica Griffin AnandTech, Ars technica and gsmarena) all say that Samsung phones lag behind other androids in terms of smoothness and app launch speed. It's a fact. I owned a S6 and my brother an S7 and my OnePlus 3 blows them out of the water. "only 4gb storage free." Time to back up your files. Ditch the 64gb storage and puny battery, one plus. Just go with 256, 512gb and 1tb. Your hometown is China so there's no way you won't get those more affordable gigabytes on your phones. Hmm You know terabyte is not even the limit right? Theres still exabyte and petabyte and so on. DO NOT believe ANYTHING coming from Oppo/OnePlus...UNTIL it can be INDEPENDENTLY verified! They have "skewed" their specs, their product since the beginning. Until some independent source gets a RETAIL VERSION of the phone, DON'T trust anything! IMHO for these type of shots is HDR or any kind of high dynamic range not that good, as it kills all the lightning and atmosphere... But there are scenarios, where it could be quite usable (cities, landscape, interiors with windows in backgrounds, etc).